As the struggle for your attention continues among smartphone makers, LYF has just announced a new phone at a decent price of N20.000. The new Flame 1 smartphone is one of the latest in the shelves of the Indian smartphone company. The LYF Flame 1 at least offers a midrange specification to compete with big names like Samsung. 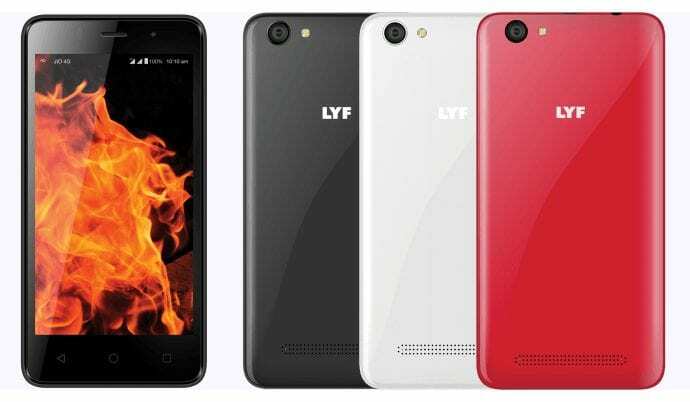 The LYF Flame 1 smartphone which comes in black, white, Dark red and DARK blue variants measures 132.6mm x 66.2mm x 9.3mmand weighs 138 grams. Putting this in perspective, the device is portable and light weight. In terms of display, the LYF Flame 1 offers you a decent 4.5-inch FWVGA (854 x 480 pixels) display. While this may not be seen as a high one, it should deliver some level of brightness and screen clarity. In terms of the camera, the Flame 1 smartphone from LYF COMES equipped with a 5MP rear snapper with flash, and a 5MP front-facing camera. It also supports camera features such as blink detection, smile detection and so on. There’s 8GB of onboard storage that is expandable up to 32GB via a microSD card slot. and coupled with 1GB of RAM. It also includes GPU Adreno 304 @400MHz. The device runs Android Lollipop 5.1. On the connectivity front, we get 4G LTE bands with a dual SIM setup, support for VoLTE, VoWiFi, GPS and Bluetooth v4.0. Finally, a 2000mAh battery completes the package.